Welcome to Cedefop Policy Forum: “What role for community lifelong learning centres? The potential of one-stop shops for preventing youth at risk from disconnecting”. 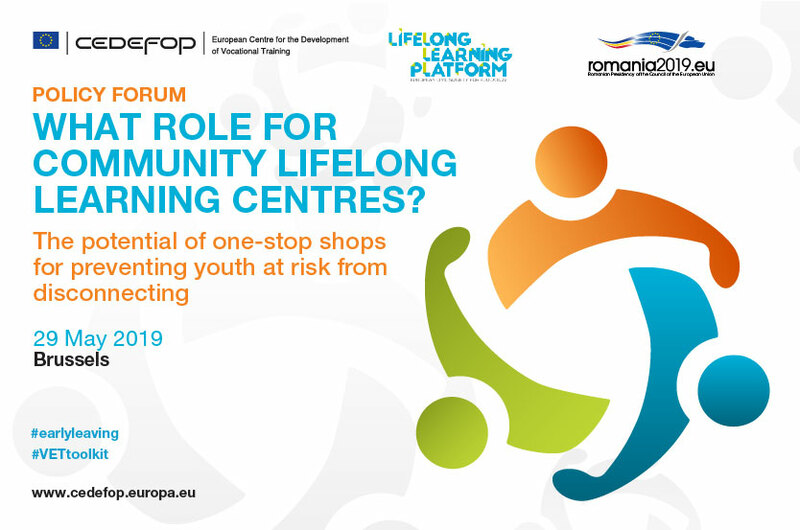 Cedefop, in cooperation with the Lifelong Learning Platform is organising this policy forum to explore the potential of community lifelong learning centres as one-stop shops for preventing young people at risk and early leavers from education and training from disconnecting. The event will be hosted by the Romanian Presidency of the Council in its permanent representation to the EU in Brussels. This policy form will involve the participation of approximately 80 Brussels-based stakeholders from the permanent representations of Member States to the EU, the European Commission, the European Parliament, European agencies, European business and sector associations, trade union and employee organisations, as well as national policy-makers, practitioners and social partners involved in designing and implementing integrated services to tackle early leaving from education and training. From a lifelong perspective, tackling early leaving from education and training (ELET) is an ongoing process, which requires a multidisciplinary and whole community approach. The EU currently focuses on young people aged 18 to 24 who did not complete upper secondary education. However, evidence shows that skills and competences acquired during the first years of life affect future education and employment prospects. At the same time, thanks to support available, adults who had previously ruled out education and training are increasingly rediscovering their learning potential. This is why tackling early leaving from education and training begins as early as in kindergarten (early childhood education), and includes compensation measures to support young adults in acquiring at least an upper secondary qualification. The forum will focus on the potential of multidisciplinary teams in community lifelong learning centres (CLLC) to play a key role in tackling ELET. The forum will be an opportunity to discuss Member State experiences in using integrated service delivery (one-stop shops, case management and multi-skilled teams) in different settings. Participants will consider the potential for establishing CLLCs in disadvantaged areas across Europe. These would offer access to a wider range of learning opportunities for people of all ages, maximising the support offered by multidisciplinary teams. Participants will also be invited to reflect on the post-2020 agenda in the field to ensure continued progress towards improving EU citizens’ qualifications and skills. Explore and learn from selected good practices in Europe providing a more integrated solution to youth at risk through community-based LLL centres. Identify key elements to be transferred or replicated from good practices across Europe. Strengthen the case for establishing CLLCs across Europe. Acknowledge achievements and reflect on the post-2020 agenda for tackling early leaving form education and training. Explore the new edition of the Cedefop VET toolkit for tackling early leaving and its updated resources. Get familiar with the Cedefop Reflection tool assisting policy makers in taking action towards a comprehensive approach to tackling early leaving from education and training. Learn about the role of ambassadors to Cedefop’s VET toolkit for tackling early leaving and join the community of practice. The Policy Forum will require active participation from all participants involved in dialogue and exchange of good practices and experiences in the plenary sessions. We hope that you enjoy and find this event fruitful. Looking forward to meeting you in May.